Disasters are stressful life situations that result in great terror, property damage, physical harm, and often death. Calamity and catastrophe, synonymous terms for these traumatic events, often involve extreme forces of nature like earthquakes, fires, floods, hurricanes, and tornadoes. Sometimes, though, people's behavior is the causal factor behind a disaster, or is contributory to higher losses of property and lives from events that were clearly avoidable. This happens through human error (a pilot's engineering mistake in an airplane crash), human carelessness and indifference (lax building practices), and intentional acts of cruelty and violence by some individuals against others (incidents of terrorism). Whatever the cause, disaster victims must struggle to resolve their losses and rebuild their lives, a process that generally takes longer than anyone initially imagines. Devastating acts of nature have led to some of the world's most memorable disasters. Earth, air (wind), fire, and water, the original four elements named by the noted Greek philosopher Empedocles, are key ingredients in the recipe for many disasters. For instance, storms often bring a combination of damaging winds, flooding rains, and lightning that sparks fires. Disturbances within the earth's crust can trigger eruption of volcanoes, the severe ground cracking and shaking of earthquakes, and the flowing walls of water that become damaging tidal waves. Cyclones and anticyclones. Cyclones are large, swirling windstorms. Though people sometimes refer to tornadoes as cyclones, meteorologists generally consider cyclones to be much larger systems with lower air pressure at their center than is present outside the weather system. Anticyclones have the opposite trait in that the air pressure at their center is higher than is present outside the system. The airflow also differs, with cyclones turning counterclockwise in the northern hemisphere and clockwise in the southern hemisphere and anticyclones doing the opposite. When these storms occur in the tropics they are known as tropical depressions and, in addition to the wind, they often have associated heavy rains. If the storms grow to a point that they reach certain sustained wind speeds, they will be classified as hurricanes or typhoons. East Pakistan was hit by the world's worst cyclone in November 1970—200,000 people died and 100,000 others were missing from the storm and a related tidal wave. Southeastern Bangladesh lost 131,000 people (and millions of others died later due to storm-related hunger and disease) following an April 1991 cyclone. Earthquakes. Rock formations sometimes shift within the earth's crust, a phenomena scientists refer to as plate tectonics. As the rock plates slide along fault lines (veins between the formations along which the shifting occurs), the resulting vibrations sometimes cause violent shaking of the ground. This surface activity may set off landslides, tidal waves on lakes or oceans, and volcanic eruptions. Taken together, these forces often result in building collapses and other damage to infrastructure (roads, bridges, dams, electrical power transmission lines, natural gas pipelines, etc.) that, in turn, injures or kills many people in the affected area. Even after the initial shaking ends, aftershocks may cause additional damage and continue to frighten residents of the area. Shaanxi, China, suffered one of the worst earthquake losses in history with 830,000 deaths from a quake that occurred in 1556. San Francisco's 1906 earthquake took 500 lives and touched off a spectacular fire that consumed four square miles of the city. Most memorable to many readers, though, is the more recent San Francisco area quake that occurred on October 17, 1989, as many baseball fans around the world were settling in to watch a World Series game on television. That one killed 67 people and caused billions of dollars in damage. Other countries tend to suffer far more serious loss of lives than the United States due to a combination of high population density in cities with infrastructures not built to withstand the ravages of an earthquake. Floods. Whenever unusually large amounts of water fall on dry land, or when water from oceans, lakes, rivers, and streams overflows onto dry land, the damaging result is flooding. Many people first learn that rushing water can easily cause extreme property damage and death by hearing the Old Testament story of Noah saving pairs of animals from the great deluge of forty days and nights of rain. The worst recorded loss of life from flooding occurred in Kaifeng, China, in 1642. War was raging and rebel forces destroyed a protective sea-wall, resulting in the loss of 300,000 lives. The worst flood in the United States came as a result of a tidal surge that accompanied the September 8, 1900, Galveston Hurricane (Galveston, Texas) that took 6,000 to 8,000 lives. Another notable flood— the Johnstown, Pennsylvania, flood—occurred on May 31, 1889, causing 2,209 deaths. Heavy rains caused the Lake Conemaugh Reservoir dam to fail, allowing a devastating wall of water to slam the city. Debris from damaged property added to the losses when it jammed at a bridge in the downtown area that then caught fire. In 1993 the midwestern United States was devastated by summer-long flooding. Torrential rains caused rivers and streams to wash over their banks and damage thousands of homes and businesses. Although there were only 46 deaths attributed to the flooding, the region suffered millions of dollars in financial losses. Farming was totally disrupted, as everyone waited for the water to recede and the fields to dry out. Adding to the misery was the fact that many caskets surfaced and washed away from cemeteries located next to waterways that were out of control, reopening emotional wounds and complicating bereavement for many flood victims. All of this led to a great sense of collective solidarity, as people throughout the country assisted in a mammoth relief effort. Hurricanes and typhoons. The terms hurricane and typhoon come from words that mean "big wind" (the West Indian word huracan ) and "great wind" (the Chinese word taifun ). As large tropical storms reach and sustain maximum wind speeds of at least 75 miles per hour, they officially become hurricanes (if occurring in the Atlantic Ocean or the eastern Pacific) or typhoons (if occurring in the western Pacific). Some of the worst storms are able to reach wind speeds in excess of 180 miles per hour and drop over 10 inches of rain in one day. Oddly, at the center of these storms is a calm area known as the eye of the storm that has relatively light winds and blue sky overhead. Summertime is hurricane season for the United States and many nearby islands. The worst loss of lives in the Western Hemisphere came when 20,000 to 22,000 people died in Barbados, the West Indies, Martinique, and St. Eustatius, as a result of the Great Hurricane of 1780. Since 1953 storms have received names from the National Weather Service. A storm named Hurricane Mitch (October 1998), killed 11,000 people in Central America, left 2 to 3 million people homeless, and caused $5 billion in damage. Hurricane Andrew (August 1992) killed only 14 people when it ravaged southern Florida and the Gulf Coast, but it was the nation's most costly hurricane, causing $15 to $20 billion in damage. In some communities family residences sustained excessive damage because zoning rules had been ignored and the homes were not structurally able to withstand the easily foreseeable winds in that hurricane-prone area. In September 1906, 10,000 lives were lost when a typhoon with a tsunami (tidal wave) struck Hong Kong. Typhoon Vera (September 1959) caused 4,464 deaths in Honshu, Japan. Thelma (November 1991) took 3,000 lives in the Philippines. Several thousand fishermen died in December 1949, when a typhoon caught Korea's fishing fleet in an offshore location. Tornadoes. People often refer to tornadoes as "twisters" and know them as the tightly spiraling funnels of wind and debris that can destroy anything in their path. If they pass over water, they may form a waterspout, but generally waterspouts are less serious weather phenomena that can happen even when no storm is present. For many people who do not live in tornado-prone areas, the first knowledge of these devastating weather events often comes through media coverage or from movies. For instance, a famous big-screen twister carries a Kansas farmhouse to a mystical land on the other side of the rainbow in the classic 1939 film The Wizard of Oz. 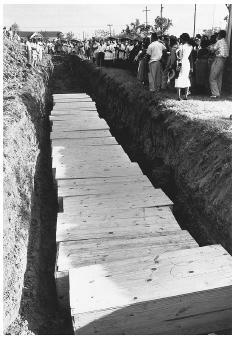 A trench holds coffins of the unidentified victims of Hurricane Audrey, which hit the coast of Louisiana in June 1957, killing an estimated 400 people. warm air systems ahead of them. They are classified on a scale known as the Fujita-Pearson scale that considers the touchdown path's length and width along with the maximum wind speed. Estimated speeds of 500 miles per hour are considered possible with the nastiest storms. The worst single tornado event in U.S. history occurred on March 18, 1925, when Missouri, Illinois, and Indiana's Tri-State Tornado left 689 people dead and injured over 2,000. In March 1952 a two-day, six-state outbreak killed 343 people in Alabama, Arkansas, Kentucky, Missouri, Mississippi, and Tennessee. Another two-day event known as the Super Tornado Outbreak (April 1974) involved 146 twisters in 13 states. When it was all over, 330 people were dead and 5,484 were injured—the most in U.S. history. Tsunamis. Ground-changing and ground-shaking events like earthquakes, volcanic eruptions, and landslides sometimes generate large water waves known as tsunamis. This is especially common when the event occurs under the sea. Tsunamis are most common in the Pacific Ocean due to the frequency of seismic activity there. In 1883 an eruption of the Krakatoa volcano created a 120-foot wave that killed over 36,000 people in neighboring Papua New Guinea. That island is clearly prone to tsunamis. In 1998 three smaller waves killed over 2,000 people. Volcanoes. Hot gas and lava (molten rock) sometimes explosively vent from deep inside the earth. The venting comes in the form of volcanic eruptions that push the ground upward, forming hills and mountains as they spew the magma (liquid, rock fragments, and gases) from openings at their tops. In the 1883 eruption of the Krakatoa volcano, the explosion could be heard 3,000 miles away and volcanic dust circled the earth. In November 1985 the Colombian towns of Armero and Chinchina lost 25,000 persons during an eruption of Nevada de Ruiz. Italy's Mt. Vesuvius erupted in 79 C.E., killing thousands when it buried the cities of Herculaneum and Pompeii. The United States has also known active volcanoes. Washington State's Mt. St. Helens, for example, erupted in May 1980, killing 60 people along with countless animals, and damaging trees over a 500-kilometer area. The large island of Hawaii has Kiluea, which has become a tourist attraction thanks to an ongoing flow of lava. The Caribbean island of Montserrat also still has an active volcano, Soufriere Hills. During the summer of 1997 its eruption killed 20 people and left two-thirds of the island uninhabitable. More extreme phenomena. Other extremes of nature also take their toll in property damage and lost lives. The central and eastern United States experienced a heat wave during the summer of 1980 that took 10,000 lives and caused $20 billion in damage. The Blizzard of 1988 pummeled the East Coast with snow for three days, leaving 400 dead and $20 million in damage from the 5 feet of snow it dropped in many areas. Another more recent blizzard, the March 1993 Storm of the Century, left 270 people dead and caused $3 to $6 billion in damage. Drought is another weather extreme. In addition to obvious water shortages, a lack of precipitation can lead to crop damage or loss and then unemployment among those who work in agriculture-related fields. The longest drought in U.S. history came in the 1930s, when many areas of the country were suffering through the Great Dust Bowl. John Steinbeck's novel The Grapes of Wrath (1939) details the struggles that farmers commonly faced during those very difficult times. Many disasters have other than natural roots. The interplay of humans and machines sometimes results in accidents. Faulty design and/or engineering, unsafe building practices, and ignorance of safety procedures all cause many unnecessary injuries and deaths. Worse yet, people will sometimes intentionally cause a disaster in an effort to scare, control, and/or inflict harm on others. Aircraft incidents. On March 27, 1977, a Pan Am 747 and a KLM 747 collided on an airport runway in the Canary Islands, resulting in the worst aircraft disaster in history. There were 582 deaths—all 249 on KLM and 333 of the 394 aboard Pan Am. The worst single plane incident occurred on April 12, 1985, when a Japan Air 747 crashed into a mountain in Japan—520 of the 524 passengers died. The loss of another jumbo jet, an Iran Air A300 Airbus on July 3, 1988, killed 290 people. Human error was the cause: While operating in the Persian Gulf, the U.S. Navy mistakenly identified the plane as an attacking enemy jet and shot it down. Perhaps the most spectacular aviation disaster ever recorded on radio and film was the May 6, 1937, crash of the Hindenburg, a German zeppelin (passenger blimp). The incident happened as the blimp was about to moor at a docking mast on an airfield at the Naval Air Station in Lakehurst, New Jersey. Something sparked an explosion and fire that brought the flaming ship down. In a mere matter of seconds, thirty-six people died and many others suffered burns and other injuries. The radio commentator Herbert Morrison described the incident to a stunned audience. His most memorable and quoted line was "Oh, the humanity, and all the passengers screaming around here!" Buildings and construction. Injuries and deaths often result from accidents involving structural failures. On March 12, 1928, the St. Francis Dam in Santa Paula, California, collapsed, killing 450 people. On June 29, 1995, the Sampoong Department Store in Seoul, Korea, collapsed, leaving 206 people dead and 910 injured. On July 18, 1981, a sky-walk collapsed during a dance being held at the Hyatt Regency Hotel in Kansas City, Missouri, killing 118 people and injuring 186. This event led to helpers offering well-documented emotional support for survivors and the family members of those lost. So did the November 17, 1999, deaths of 12 students from Texas A&M University in College Station, Texas. They were killed when a log pile structure that they were building for an annual pre-football game bonfire collapsed. Ecological and environmental incidents. During the January 1991 Persian Gulf War, Iran intentionally spilled over 460 million gallons of crude oil into the Persian Gulf. It also dynamited and set ablaze 650 oil wells in Kuwait, making this the world's worst intentionally caused environmental disaster. On June 3, 1979, the Ixtoc 1 oil well in the Gulf of Mexico experienced an estimated spill of 140 million gallons of crude oil—the largest spill ever. Fortunately there was very low impact on the environment. On March 16, 1978, the Amaco Cadiz supertanker spilled 68 million gallons of crude oil off Portsall, France, damaging over 100 miles of coastline, making it the largest tanker spill in history. The worst U.S. event was the March 24, 1989, spill of over 10,000 gallons of crude oil in Prince William Sound, Alaska, by the Exxon Valdez supertanker. Wildlife suffers the most when these ecocatastrophes happen. Explosions. Coal mine explosions around the world have taken many lives. Some examples include Courriaees, France (March 10, 1906), with 1,060 deaths; Omuta, Japan (November 9, 1963), with 447 deaths; Coalbrook, South Africa (January 21, 1960), with 437 deaths; Wankle, Rhodesia (June 6, 1972), with 427 deaths; and Bihar, India (May 28, 1965), with 375 deaths. The worst explosion in the United States occurred on May 1, 1900, in Scofield, Utah, when blasting powder ignited and killed 200 people. Fires. A waterfront fire in Chongqing, China, took 1,700 lives on September 2, 1949, making it history's worst fire. The worst fire in U.S. history occurred on December 30, 1903, at the Iroquois Theater in Chicago, Illinois, where 602 people died. Much more widely known, however, is the November 28, 1942, fire at the Coconut Grove Nightclub in Boston, Massachusetts. That fire caused 491 deaths among a group of patrons that was heavily comprised of members of the military and their dates for the evening. Most notable there was the fact that many survivors were interviewed and helped by mental health professionals from a nearby hospital in what may have been the first documented use of disaster mental health techniques. Another major U.S. fire was the Chicago Fire of October 8, 1871, during which 50 people lost their lives and 17,450 buildings were burned. The damage estimate for that fire was $196 million. Industrial and nuclear accidents. On December 3, 1984, a toxic gas leak occurred at the Union Carbide plant in Bhopal, India, resulting in over 2,000 deaths and 150,000 injuries. The world's worst release of radiation was on April 26, 1986, when an accident occurred at the Chernobyl Nuclear Plant in Kiev in the former Soviet Union. The official death toll was 31, but estimates calculate that thousands may have died. When a partial meltdown occurred in the reactor at the Three Mile Island Nuclear Plant in Harrisburg, Pennsylvania, on March 28, 1979, no lives were lost. Nevertheless, there was a major, negative, and lasting psychological impact on residents of the area. Shipwrecks. Two of the worst losses of lives in passenger shipping occurred in China during 1948. In November, a troop carrier sank with an estimated 6,000 people onboard. Then, the following month, about 3,000 refugees were lost when their ship sank. On December 12, 1987, the ferry Dona Paz collided with an oil tanker off the coast of Manila—over 4,000 people died. On December 12, 1917, a steam ship collided with the ammunition ship Mont Blanc in Halifax Harbor, Nova Scotia, and 1,600 people died as a result of the explosion that followed. In the United States, the worst event occurred on April 27, 1865, when the Sultana, a Mississippi River steamboat carrying Union soldiers home from two infamous Confederate prison camps at the end of the Civil War, suffered an explosion in its boiler—1,547 people were killed. Another major shipping accident happened on April 16, 1947, in Texas City, when the Grand Camp caught fire. A large crowd formed to watch firefighters battle the blaze and no one realized that the ship's cargo was highly explosive ammonium nitrate fertilizer. When it blew up, 600 people were killed by a combination of the shock waves, a small tidal wave, and several other resulting fires. On April 15, 1912, one of the most famous accidents in shipping occurred when the British ocean liner Titanic sank after hitting an iceberg on its maiden, transatlantic voyage; over 1,500 people died. Three years later, another famous liner, the Lusitania, was sunk by a German submarine near the coast of Ireland. The deaths of 1,198 people there helped draw the United States into World War I. When the battleship Arizona and the rest of the Pacific fleet in Pearl Harbor, Hawaii, was bombed on December 12, 1942, 1,177 were killed, making it the worst loss in U.S. naval history. There is also the July 25, 1956, collision of two ocean liners—the Andrea Doria and the Stockholm —off Nantucket, Massachusetts. This accident, in which 52 people died, is another disaster that produced early, well-documented emotional support for survivors. Space exploration. Efforts to travel in space have resulted in their share of tragedies. On March 18, 1980, a Vostok rocket exploded during refueling at the Plesetsk Space Center in the former Soviet Union; 50 people were killed. The U.S. Space Shuttle program experienced its worst disaster on January 28, 1986, when the Challenger craft exploded in the air shortly after liftoff. A booster rocket fuel leak caused the explosion and fire that killed seven astronauts to their deaths just off Cape Kennedy, Florida. Many Americans, including most school-children, watched the accident on live TV because Christa McAuliffe, America's first teacher in space, was aboard. Another tragedy for the United States was the Apollo 1 fire on January 27, 1967. Three astronauts died at Cape Kennedy when an accidental fire erupted in their space ship during a routine launch pad practice exercise. Sports. Disasters can happen anywhere, even at recreational events. On October 20, 1982, 340 soccer fans died in a sudden crush of people all moving about at the end of a match in Moscow's Lenin Stadium. Similar problems happened at a Peru versus Argentina soccer match in Lima, Peru, on May 24, 1964, when rioting occurred after a disputed call by a referee; over 300 people died and 500 were injured. In Sincelejo, Colombia, 222 people died on January 20, 1980, when the bleachers collapsed at the town's bullring. Terrorism. Terrorism is the use of violence in an attempt to intimidate, control, and/or punish others in hopes of advancing a political agenda. On December 12, 1988, a terrorist bomb brought down a Pan-Am flight bound for New York City. The Boeing 747 crashed in Lockerbie, Scotland, killing all 259 passengers and 11 people on the ground. Two U.S. embassy bombings occurred on August 7, 1998, killing 243 people in Nairobi, Kenya, and 10 people in Dar Es Salaam, Tanzania; there were also 1,000 other people injured in these attacks. The worst acts of terrorism on American soil came on September 11, 2001, when a coordinated group of terrorists commandeered four large commercial passenger jets and turned them into weapons of mass destruction. They crashed two of them into the twin towers of New York City's World Trade Center, causing both to collapse. They crashed the third plane into the Pentagon in Washington, D.C. Heroic passengers on the fourth plane had gotten word of the other hijacked planes and took action that resulted in the crash of their plane in a field in western Pennsylvania. This crash was far from any intended terrorist target, although the White House was the suspected objective. Although initial estimates of those lost were 6,000 people (or more), the current death toll from these four crashes is estimated to have been closer to 3,200 people. Another major U.S. terrorist event was the April 19,1995, truck bombing of the Federal Building in Oklahoma City, Oklahoma. The blast killed 168 people, including 19 children from a daycare center located in the building. In all, 221 buildings sustained damage. There had also been an earlier attack on New York's World Trade Center complex—a bombing on February 26, 1993, that resulted in 6 deaths and 1,040 injuries. Lessons learned in that attack helped save many lives during the September 11, 2001, tragedy. Terrorism has also taken the form of product tampering. In September 1982 someone laced the pain medication Tylenol with cyanide poison and placed the packages in circulation in the Chicago area, leading to 7 deaths. That incident and other copycat behavior led drug manufacturers to place safety seals on each package. Similar seals quickly became standard on many other consumable foods and beverages. People are almost always changed by their disaster experiences, but they need not be damaged by those experiences. Victims and relief workers who have been traumatized generally will not stop functioning, but they will react in fairly predictable ways (with some differences due to age and level of maturity). By using various crisis intervention techniques, the victims and relief workers can be triaged, briefly counseled (or referred for formal services, if needed), and returned to predisaster levels of functioning as quickly as possible. Persons and communities struck by disaster will often experience four distinct phases of response to the disaster. First, there is a heroic phase that may even begin prior to impact and that can last up to a week afterward. During this phase people struggle to prevent loss of lives and to minimize property damage. This phase is followed by the honeymoon phase, which may last from two weeks to two months. During this phase, massive relief efforts lift spirits of survivors, and hopes for a quick recovery run high. Sadly, for most people this optimism is often short-lived and, all too soon, the disillusionment phase begins. This phase may last from several months to a year or more. Social scientists sometimes call it the second disaster, as it is the time when the realities of bureaucratic paperwork and recovery delays set in. Outside help has often come and gone and people realize that they must do more themselves. Eventually, the reconstruction phase begins. This phase may take several years as normal functioning is gradually reestablished. There are many more specific changes that people may experience. Disasters can cause behavioral changes and regression in children. Many react with fear and show clear signs of anxiety about recurrence of the disaster event(s). Sleep disturbances are very common among children and adults and can best be handled by quickly returning to or establishing a familiar bedtime routine. Similarly, school avoidance may occur, leading to development of school phobias if children are not quickly returned to their normal routine of school attendance. Adults often report mild symptoms of depression and anxiety. They can feel haunted by visual memories of the event. They may experience psychosomatic illnesses. Pre-existing physical problems such as heart trouble, diabetes, and ulcers may worsen in response to the increased level of stress. They may show anger, mood swings, suspicion, irritability, and/or apathy. Changes in appetite and sleep patterns are quite common. Adults, too, may have a period of poor performance at work or school and they may undergo some social withdrawal. Middle-aged adults, in particular, may experience additional stress if they lose the security of their planned (and possibly paid-off) retirement home or financial nest egg, and/or if they are forced to pay for extensive rebuilding. Older adults will greatly miss their daily routines and will suffer strong feelings of loss from missing friends and loved ones. They may also suffer feelings of significant loss from the absence of their home or apartment, or its sentimental objects (paintings, antiques, Bibles and other spiritual items, scriptures, photo albums, and films or videotapes), which tied them to their past. Timing of the onset of these changes varies with each person, as does duration. Some symptoms occur immediately, while others may not show until weeks later. Just about all of these things are considered normal reactions, as long as they do not last more than several weeks to a few months. The one commonality among disaster victims is that most everyone will be changed in some way by the experience, often marking time differently in its wake (speaking of what life has been like since the traumatic event). The personal impact of disasters tends to be much worse whenever the disaster events are caused by intentionally destructive human acts than by natural causes (or pure accidents). Whenever inhumanity plays a major role in causality, survivors seem to need extra time to resolve their losses and move forward with their lives. This relates directly to the greater amount of anger involved, overexposure from repetitive media coverage, and the fact that any true sense of closure may not come until the perpetrators are found and prosecuted. When disasters happen, the public demands answers and action. Mitigation efforts will often initiate social changes designed to prevent reoccurrences. Natural disasters prompt research to improve early warning systems and enforce sturdier construction methods. Transportation accidents trigger investigations that lead to new safety regulations, improved operating procedures, and the redesign of problematic equipment. Acts of terrorism stimulate public debate over curtailment and/or abridgement of civil liberties, often resulting legislative remedies and, in some cases, retaliatory military action. Disaster mental health (DMH) is an expanding field of crisis intervention that addresses several aspects of traumatology, affecting both victims and relief workers who have experienced natural or human-caused disasters. Crisis workers strive to help people recognize, understand, and accept some of the common changes that often occur in the days, months, and years following any traumatic disaster event(s). The goal of DMH intervention is to help assure that the victims (and helpers) become survivors by doing whatever can be done to prevent long-term, negative consequences of the psychological trauma such as the development of posttraumatic stress disorder. DMH work involves extensive use of outreach skills and simple approaches, including offering informal greetings, providing snacks/drinks, doing brief, supportive defusing interviews, to help people begin problem solving. For many people, DMH work also involves grief counseling to assist survivors as they begin to mourn their losses. For those who have experienced severe psychological trauma, formal debriefing interviews are the preferred method to begin helping people let go of the pain, face their losses, and prepare to begin moving forward with their lives. Defusing and debriefing are two of the primary tools used in providing help. Both involve offering individuals or groups of people opportunities to talk things out in a safe and supportive atmosphere. Both are voluntary offerings made to those who are ready and willing to tell their upsetting disaster stories and learn ways to cope with the residual stress. Defusing is the term given to the initial process during which DMH workers begin helping traumatized people talk things out. It works like taking the fuse out of a bomb (or an explosive situation), by allowing victims and workers the opportunity to ventilate about their disaster-related memories, stresses, losses, and methods of coping in a safe and supportive atmosphere. The defusing process usually involves informal and impromptu sessions that help release thoughts, feelings, and fears which might not otherwise be appropriately expressed. Debriefing is longer and more formally structured interview process that has grown from the researcher Jeff Mitchell's 1983 Critical Incident Stress Debriefing (CISD) model. The CISD model was designed for use with first responders (including police, firefighters, and emergency medical technicians), to help them overcome the emotional aftereffects of critical incidents (line-of-duty deaths). Sessions were usually held within the first twenty-four to seventy-two hours after the traumatic event, with follow-up sessions as needed. Given the nature of disasters, it is not always possible to identify all of the victims that quickly. Fortunately, the debriefing process is still beneficial, even when the sessions are held long after the event. Local, state, and federal government officials play a major role in both disaster preparedness and disaster relief. The Federal Emergency Management Agency (FEMA) is an independent agency of the federal government that reports directly to the president. Since it was founded in 1979, FEMA workers have coordinated both the nation's planning for disasters and the mitigation efforts that are needed once they occur. States and most local communities also have emergency management agencies that take responsibility for coordinating disaster preparedness and relief efforts in their areas. Providing relief services since 1881, the American Red Cross (ARC) has been chartered by the U.S. Congress to provide disaster relief services and it is the best group to call for initial advice about preparedness and emergency assistance. ARC workers, many of whom are volunteers, provide predisaster education programs, as well as postdisaster damage assessment, mass care sheltering and feeding, health services, and emergency assistance to families. By offering support and replacing some lost items (clothing, food, and health care items), relief efforts jump-start the recovery process. Since 1989 ARC has taken the lead in recruiting and training volunteers to serve on DMH service teams whenever and wherever their services may be needed. The American Psychological Association, the American Counseling Association, the National Association of Social Workers, the American Psychiatric Association, the American Association of Marriage and Family Therapists, several professional nursing organizations, and many other such groups help supply the needed workers. ARC is just one of over twenty relief organizations that work together as members of local, state, and national relief efforts, including the nationally run National Volunteer Organizations Active in Disaster (NVOAD). Each local Volunteer Organization Active in Disaster (VOAD) organization has its own area(s) of specialization, including feeding, sheltering, child care, ham radio communication, and construction/repair. Representatives of VOAD member organizations hold regular meetings to facilitate planning efforts and the sharing of resources. Relief workers often put in twelve- to fourteen-hour days, sometimes doing so for weeks at a time, and thus need to be mindful of stress management and self-care. Burnout is a serious hazard for disaster workers. The use of peer support is the best method to cope with stress. Health care professionals urge relief workers to take breaks, schedule time off, use humor, maintain a proper diet, exercise, and get generous amounts of restful sleep. Keeping a personal journal (a log of what was seen, thought, and felt) and writing a narrative at the end of the assignment often help many relief workers. Dingman, Robert, ed. "Disasters and Crises: A Mental Health Counseling Perspective." Journal of Mental Health Counseling 17, no. 3 (1995). Everly, George S. "The Role of the Critical Incident Stress Debriefing (CISD) Process in Disaster Counseling." Journal of Mental Health Counseling 17, no. 3 (1995):278–290. Figley, Charles R., ed. Compassion Fatigue: Coping with Secondary Traumatic Stress Disorder in Those Who Treat the Traumatized. New York: Brunner/Mazel, 1995. Friedman, Stanford B., et al. Psychosocial Issues for Children and Families in Disasters: A Guide for the Primary Care Physician. Substance Abuse and Mental Health Services Administration Publication No. SMA 95-3022. Rockville, MD: Center for Mental Health Services, 1995. Lindemann, Erich. "Symptomatology and Management of Acute Grief." American Journal of Psychiatry 101 (1944):141–148. Mitchell, Jeffrey T. "When Disaster Strikes ... The Critical Incident Stress Debriefing Process." Journal of Emergency Services 8, no. 1 (January 1983):36–39. Morgan, Jane. "American Red Cross Disaster Mental Health Services: Implementation and Recent Developments." Journal of Mental Health Counseling 17, no. 3 (1995):291–300. Myers, Diane G. Disaster Response and Recovery: A Handbook for Mental Health Professionals. Substance Abuse and Mental Health Services Administration Publication No. SMA 94-3010. Rockville, MD: Center for Mental Health Services, 1994. Parad, Howard J., et al. "Crisis Intervention and Emergency Mental Health Care: Concepts and Principles." In H. L. P. Resnik and Harvey L. Ruben eds., Emergency Psychiatric Care: The Management of Mental Health Crises. Bowie, MD: The Charles Press, 1975. Siporin, Max. "Disasters and Disaster Aid." In Encyclopedia of Social Work, 18th edition. Silver Spring, MD: National Association of Social Workers, 1987. Ursano, Robert J., Carol S. Fullerton, and Ann E. Norwood. "Psychiatric Dimensions of Disaster: Patient Care, Community Consultation, and Preventive Medicine." Harvard Review of Psychiatry 3, no. 4 (1995):196–209. Weaver, John D. "How to Assist in the Aftermath of Disasters and Other Life Crises." In Leon VandeCreek and Thomas L. Jackson eds., Innovations in Clinical Practice: A Source Book, Volume 17. Sarasota, FL: Professional Resource Press, 1999. Weaver, John D. "Disaster Mental Health Services." In Linda Grobman ed., Days in the Lives of Social Workers. Harrisburg, PA: White Hat Communications, 1996. Weaver, John D. Disasters: Mental Health Interventions. Sarasota, FL: Professional Resource Press, 1995. Young, Bruce H., et al. Disaster Mental Health Services: A Guidebook for Clinicians and Administrators. Menlo Park, CA: Department of Veterans Affairs, 1998. "Disasters." In the Information Please Almanac [web site]. Available from www.infoplease.com/ipa/A0001437.html . Everly, George S., and Jeffrey T. Mitchell. "A Primer on Critical Incident Stress Management." In the International Critical Incident Stress Foundation [web site]. Available from www.icisf.org/inew_era.htm . "NASA's Natural Disaster Reference Database." In the NASA [web site]. Available from http://ltpwww.gsfc.nasa.gov/ndrd/ . Weaver, John. "Working with Those Who Have Experienced Sudden Loss of Loved Ones." In the Internet Journal of Rescue and Disaster Medicine [web site]. Available from www.icaap.org/iuicode?86.2.1.2 . Weaver, John. "Sudden Death in Disasters and Transportation Accidents: A Guide to Survival for Family Members and Friends." In the Internet Journal of Rescue and Disaster Medicine [web site]. Available from www.icaap.org/iuicode?86.2.1.4 . Weaver, John. "Disaster Mental Health: Detailed Information." In the Disaster Mental Health [web site]. Available from http://ourworld.compuserve.com/homepages/johndweaver . "booster rocket fuel leak caused the explosion and fire that killed seven astronauts to their deaths just off Cape Kennedy, Florida"
To most Americans this seems unbelievable, amlsot propaganda-like. The same would be correct if you replaced the beef industry with the dairy industry . We have long been programmed to believe that milk and meat are not only good for us, but will aid the average persons health. Vegetarianism is equal to wasting away. I hope that these common beliefs about food will soon be shed in the correct light they deserve, namely that eating meat is actually harmful when you take into account the beef/chicken industry use of sterioids and antibiotics, and that consuming dairy has no benefit whatsoever that cannot be met by vegetables.